Old Forge Cottage01981 540685work Self-cateringSituated in the heart of the Wye valley, our newly refurbished Old Forge Cottage offers the perfect location for your countryside escape. Our spacious accommodation offers you the comfort of a double bedroom with an adjoining bathroom and a twin bedroom with an en-suite shower and toilet. 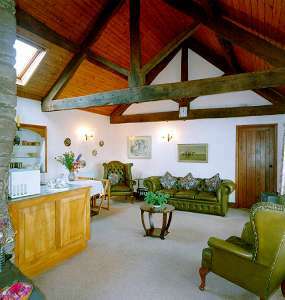 There is also a comfortable living area with a fully fitted kitchen and log burner for those cosy winter evenings. With many local attractions nearby you will be greeted with an abundance of opportunities to explore the area. The historic cathedral towns of Hereford, Worcester and Gloucester are all situated within an hour's drive. We are ideally situated for walking and cycling and we welcome dogs all year round by prior arrangement. Situated in the heart of the Wye valley, our newly refurbished Old Forge Cottage offers the perfect location for your countryside escape. Take the A49 (Ross Road) south out of Hereford. At the top of Callow Hill turn right onto the A466, signposted to Monmouth. Follow this road through Wormelow. As you leave the village go up a hill and round a bend to the right. Old Forge Cottage is located on the right immediately after the bend. Please feel free to pull into the driveway of the Lyston Smithy property. Take the A49 north towards Hereford. Once you get to the village of Much Birch turn left onto Tump Lane, signposted to Wormelow. Follow this road to the end and turn left towards Monmouth. As you leave Wormelow go up a hill and round a bend to the right. Old Forge Cottage is located on the right immediately after the bend. Please feel free to pull into the driveway of the Lyston Smithy property. Leave Monmouth on the A466 Signposted to Hereford. Follow this for approximately 11 miles. Travel through the village of St Weonards continue on the A466 for approximately 3 miles. Old Forge Cottage is located on the left. It is easier to look out for the main house name which is Lyston Smithy. Please feel free to pull into the driveway of the Lyston Smithy property. PLEASE NOTE: Google maps and iPhone maps may show the location further south than we actually are. We are working to fix this error. Ample car parking is available in front of the cottage, with additional space on the adjacent Lyston Smithy if required.